B.Tech./B.E. in Computer Science & Engineering/Computer Engineering/ Information Technology/Electronics/Electronics & Communication Engineering/Electronic Communication System Engineering/Electronics & Electrical Engineering with at least 60% marks (55% for SC/ST) in aggregate or CGPA of 6.75 on 10 point scale. Based on the Entrance Test to be conducted by the Coordinator. Senior Secondary Examination (12th grade) with Physics, Chemistry, Mathematics and English with at least 50% marks (45% for SC/ST) in aggregate. 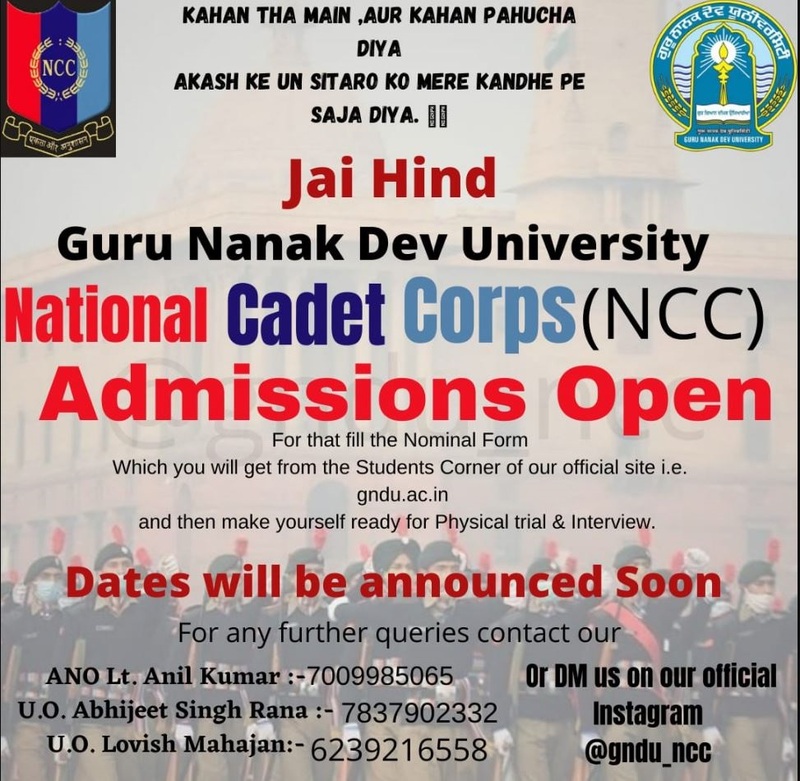 Any other examination recognized equivalent thereto by GND University, Amritsar. Admission will be made on the basis of All India Rank of JEE(Main)-2018 for both 85% quota for resident of Punjab and 15% quota for outside Punjab. Application for admission shall be submitted only on-line as per the admission schedule uploaded on GNDU admissions website www.gnduadmissions.org. The counseling will be held at GNDU Campus by the Coordinator. Counseling schedule will be uploaded on GNDU website in due course of time. The Department of Computer Engineering and Technology at Guru Nanak Dev University is engaged in cutting edge research in the areas of Wireless Sensor Networks, Cloud Computing, Big Data, Data Sciences, Image Processing and Parallel Computing. The department has dedicated research lab equipped with latest computers, high end server and with high speed Internet established under UGC 12th Plan. The department faculty has excellent publications in SCI indexed, Scopus Indexed as well as other reputed journals. The department has more than 300 publications in numerous journals and conferences. The department has dedicated research faculty as well as research scholars. The department has conducted workshops on IOT, Cloud Computing, Big Data, Data Science using STATISTICA Tool and Research Application Programming Using MATLAB, Computer Networks in collaboration with TCS, University of Jean Spain as well as Grid Analytics India Pvt. Ltd. Apart from this department has conducted many webinars to enhance the research.